Picture this: you are a 15-year old Finnish teenager and after watching BBC’s Sherlock, you become a massive fan of Benedict Cumberbatch, and so you wish to watch every film, TV series, and theatre performance involving him. The films and TV series are widely accessible – some are broadcasted in Finland and the rest you get from the library. It’s the theatre pieces that cause difficulty. How on earth are you going to be able to get enough money to buy a flight to London and tickets to see Frankenstein? (and even if you had the money, how would you get the permission from your parents?) Answer is: you don’t. 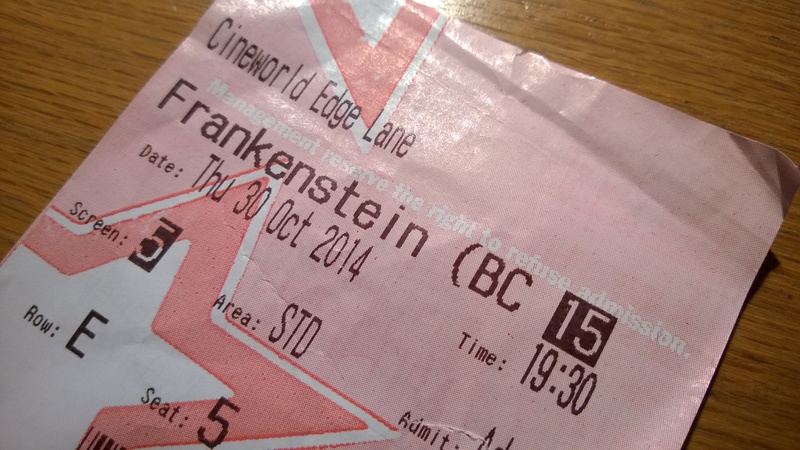 Instead, you go to your local cinema to see the National Theatre Live screening of Frankenstein, starring Cumberbatch. This is why NT Live is such a great invention. It beams West End productions to venues all around the world (whether you are in Scotland, Finland, or Singapore) and allows you to enjoy the experience for a fraction of the price. In the UK, the performances are broadcast live, whilst international screenings tend to be recordings of a performance that took place a few days ago, so not technically a live show, but that is not an issue – a great show is great, whether you saw it live or a few days later. And the shows of NT Live tend to be fantastic. I’ve seen the aforementioned Frankenstein and Hamlet, both starring Cumberbatch, as well as King Lear, starring Simon Russel Beale, Macbeth with Kenneth Branagh and Alex Kingston, and Coriolanus with Tom Hiddleston. (Looking at the list, I realise how exclusively Shakespearean it is – but Macbeth and King Lear are some of my favourite plays ever written, so forgive me.) They have all been amazing, and the actors fantastic. The top-quality technology that NT Live uses allows you to hear clearly not only the spoken lines, but also every breath, whisper, and sigh, and also allows you to see all the movements. This makes it all feel even more ‘live’. In addition, I always pay extra attention to the stage design – the amount of space you have on stage is so limited, and although different ways to change the scene are useful, there’s also limited time to do it. It’s delightful how well NT Live, with their cameras from all angles, manages to highlight all the details of stage design for cinema viewers. There has been talk about what NT Live means for live theatre and especially smaller companies who might have to compete for viewers with the live screenings. Personally, I don’t think NT Live will ever compare to an actual live performance: seeing a piece actually live, sitting in the same space with all the other audience and the actors, seeing everything with just your own two eyes. There is magic in live theatre that not even the best cameras and angles can capture, and you can only experience it by attending a live show. Thankfully, the point of NT live is not to try and replace live theatre. The point of NT Live is to make theatre more accessible. Since its launch in 2009, NT Live has had a combined audience of 5.5 million people in over 2,000 venues across the world. All the screenings I’ve attended are experiences I couldn’t have gotten any other way. The tickets, while being more expensive than normal cinema tickets, are usually around £20, which is considerably cheaper than normal theatre tickets. And the attraction of seeing a theatre piece in your local cinema is not to be underestimated – everyone knows how much easier it is to commit if it only requires you a 20-minute walk to get to the venue, rather than 8 hours on the bus. And that’s why I’ll gladly continue to support the shows – whenever I can. Something of their popularity can be told by the fact that I couldn’t get a ticket to see King Lear starring Ian McKellen at the Grosvenor cinema: I was too late and they were sold out. Oh well, at least I learned to be early next time.